Curious about Litchfield history? Well, if a town could have a mother, Litchfield’s mother would surely have been the Terre Haute, Alton and St. Louis Railroad. It was the arrival of that railroad that insured the future of Litchfield. But its fate wasn’t always so certain. Before the railroad made its way to Litchfield, a group founded Hardinsburg, expecting the railroad to come through their new town instead. Fortunately, Hardinsburg’s founders hedged their bets, building their homes on runners – just in case. When they realized the inevitable, they hitched teams of oxen and hauled the buildings over the slick prairie grass to Litchfield. It was the late fall of 1853 when Thomas Gray, the County Surveyor, laid out the town of Litchfield in a cornfield purchased by the Litchfield Town Company. The 80 acres, thus converted, became Litchfield. In January of 1854, J. M. McWilliams moved from Hardinsburg with his house and a small store, becoming its very first inhabitant. 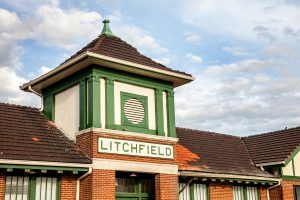 The railroad reached Litchfield in the fall of 1854, and it was then “that there began a career of rapid growth and improvement, which has not abated since,” said an early history published in 1865, some 13 years after the town’s founding. The discovery of oil and gas in Litchfield boomed the exploration for both, and two coal mines were sunk in the areas in the 1880s. As the years progressed, Litchfield was blessed with six railroads: The Wabash, now Norfolk Southern; Illinois Central; Chicago; Burlington and Quincy; The Interurban; Litchfield and Madison and the C.C.C. and St. Louis, known as the Big Four. Two remain – the C.B. and Q. and the Norfolk Southern. Among the factors that contributed to Litchfield’s continued growth was the building of U.S. Route 66, the main highway from Chicago to Los Angeles, along its western edge. Part of the original ‘Mother Road’ remains intact today, bringing tourists from all over the world. To Illinois and Missouri travelers, Litchfield is still best known as the halfway point between Illinois’ capital and St. Louis, Missouri.